We often think that objects and the things in our lives do not really reflect us in any way. Similarly we feel that something has to be alive in order for us to find any significance for its existence beyond its usefulness to us. Still others say, "Since I can not take it with me to the other side it is only marginally important to me now." However, our earth's surface is fast becoming overcrowded with man made "stuff"
that has been artificially elevated in significance by mass marketing and media. Coupled with our desires to own stuff and use it occasionally, we are almost out of space. We can look at things alongside the road and compare their condition and find a similarity to our situation in life. 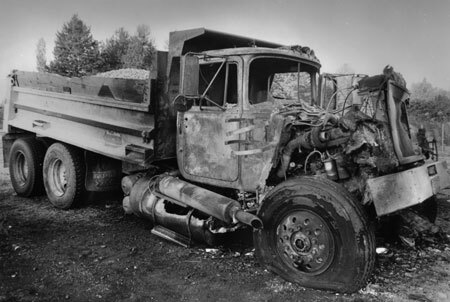 Take the case of this heavily loaded older dump truck that caught on fire while being driven down Loomis Trail Road on the way to make a delivery. Then add many thousands of miles and some unnoticed condition allowing a mid life crisis to occur. We see another by the side of the road crisis has just occurred. How often have we overloaded our lives with details, chores and daily concerns while not addressing our own basic well being and wound up totally burned out?